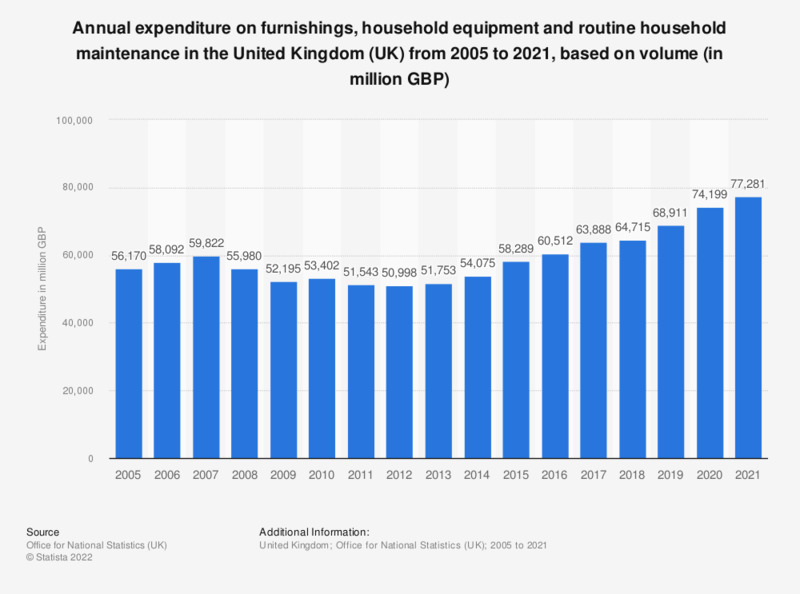 This statistic shows the total annual expenditure on furnishings, household equipment and routine household maintenance in the United Kingdom from 2005 to 2017, based on volume. In 2017, UK households purchased almost 62 billion British pounds worth of furnishings, furniture and other household equipment, including garden tools, appliances and expenditure on routine maintenance and repair services. * Household final consumption expenditure based on chained volume measures (seasonally adjusted). Figures are given here in volume terms rather than value terms to give a better picture of whether households purchased more or less goods and services over the period in consideration. Figures include consumption of furniture, funishings, carpets, other floor coverings, household textiles, household appliances (major and small, whether electrical or not), glassware, tableware, household utensils, tools for home and garden, and repairs and maintenance of all such items. Statistics on "Brand awareness: Home appliance suppliers in the United Kingdom (UK)"